Jane Austen (1775-1817) was an English novelist whose works of romantic fiction earned her a place as one of the most widely read writers in English literature. To attract younger people, why not invent a new game with modern rule? 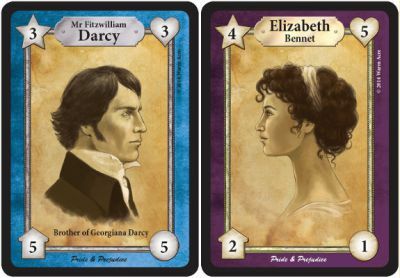 A matchmaker card game for 3 to 6 players, illustrated by Emily Hare, had been published last year by Richard Wolfrik Galland of Warm Acre Games after a successful crowd funding campaign. I have read the rule (two pages only with illustrations and examples) and the game seems quite interesting.